Representing all eleven Skagit Valley breweries, the first ever Skagit Farm to Pint FEST is truly a brewer’s festival designed by the brewers themselves. Presented by the Port of Skagit, held at Skagit Valley Malting and organized by Skagit Farm to Pint, the kick-off festival to Skagit Beer Week will offer an authentic intimate experience inside of a malt house, allowing 500 attendees to sample over 20 beers and bites made with local ingredients from the Skagit Valley while listening to local musicians and learning about the craft. Educational opportunities will be found throughout the malt house including samples of a range of malts for tasting, WSU fermentation specialist demos, experiencing the malting system, talking with the grain breeders, local maltsters and brewers. 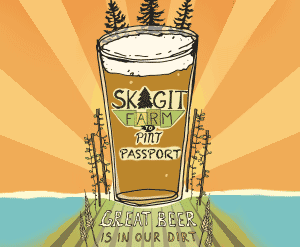 Skagit Farm to Pint FEST will take place on March 31st at Skagit Valley Malting located at the Port of Skagit. All proceeds from the festival will go to Viva Farms. Viva Farms mission is to launch a new generation of farmers. For more information, tickets and a complete list of sponsors, visit the Skagit Beer Week website.